Nestled amongst the palm trees and frangipanis of beautiful Bali, lies the most luxurious venue on the Island, Cocoon Restaurant and Beach Club. Indulging all 5 senses, Sight, Sound, Smell, Taste and Touch, you will be dazzled and exhilarated with what Cocoon has to offer. Inspired by the idyllic surroundings of the famous Bali beaches and combined with Mediterranean flair, Cocoon offers fine dining, relaxed ambience, fashion and fun. A multi dimensional venue, Cocoon provides its guests with a relaxed and informal style of wining and dining during the day and then transforms itself into a luxurious fine dining venue in the evening. Long after the sun has gone down and desserts devoured, Cocoon transforms again into a sophisticated bar / lounge offering the best in music, cocktails and a fashionably savvy crowd. Upon entering the lobby style rotunda that invites you into the ‘Cocoon’, you will be mesmerized by the design and architecture of our amazing space. Gliding through the main dining area, past the Miami inspired bar you will ultimately reach the jewel in our crown, our poolside area. With Azure blue undertones and soft opulent furnishings, there is no better place to relax and chill out poolside whilst watching the Indian Ocean lapping at the shore and sipping on fresh and exotic cocktails. Whilst laying back on your personal daybed sipping on a perfectly blended Daiquiri or Margarita, you can also indulge in our pool side grazing menu, offering a large range of delectable delights. Catering for Breakfast, Lunch and Dinner in over three distinct dining areas, Cocoon’s menus deliver a truly international cuisine with dishes fusing the best of Asian and modern European flavours and produce, our experts in the kitchen have created culinary delights that will have your mouth watering before you even order. Breakfast overlooking the beach or by the pool is a must or if it is a long lazy Lunch you are interested in, you can delve into our extensive grazing menu available in either one of our stunning dining areas, by the pool or in one of our private Bales on the beach. The Dinner menu adds an entirely new dimension to your Cocoon experience. You will revel in the quality and presentation of our amazing award winning dishes. Of course no Taste sensation journey is complete without delectable deserts, coffee and cognac and one of the most well stocked Humidors on the Island. Cohiba anyone? 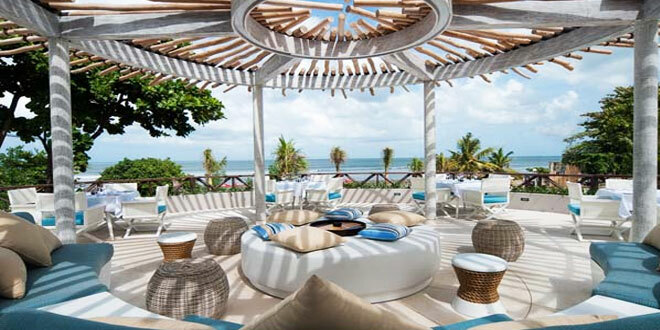 Since its inception in July 2010, Cocoon has hosted some of the Island’s hottest events. DJ’s and entertainers from around the world have graced our poolside entertainment area. Including the likes of Louis Vega, Crazy P, Stacey Pullen and the amazing Miss Vikki Butterfly, Cocoon has staked its claim as the place to be. Food that delights, surroundings that entice, music that excites all wrapped up in a single location, Cocoon Beach Club provides a 5 star sleek and stylish experience without the pretentiousness. Additional offerings include, “Cocoon Kids Sunday” with fun activities and kids menu, specialist Boutique, VIP poolside cabanas, luxury daybeds, fully serviced beachfront Bales and our private roof terrace with weddings and events fully catered for.